The former NatWest building on the north-west corner of Cornmarket (and stretching back as far as 1 George Street) was built in 1912, replacing the George Hotel. This site eventually took the number 33 Cornmarket Street, but earlier on it was 32 or 32A (a number lost from the top of the other side of Cornmarket). It was in the parish of St Michael-at-the-Northgate Church, as is the present building. There was an inn on this site from at least 1602 to 1911: it was rebuilt at least twice (in the 1770s and in 1853). For all the leases granted by the City Council for this property from 1606 to 1832, see Salter's Oxford City Properties, pp. 236–7. On 29 April 1602 the joiner Thomas Maddox of Maddocks, who was probably already the occupant, received permission to hang out the sign of the Falcon on the former building on this corner. On 4 June 1621 Robert Woolley changed the name of the inn to the Three Goats' Heads (the sign of the cordwainers of which he was a member), and it kept this name for over two centuries until it was demolished in 1853. It was often abbreviated to the Three Goats Inn. In 1748 the innholder was Thomas Payne, and in 1762 William White. The inn must have been rebuilt in the mid-1770s, as it was described as a new building in 1776. Immediately prior to 1790 James Reading was the innholder here, and following his death Samuel White took over. On 1 May 1804 a lease was granted to the brewers Mark and James Morrell, and the innholder then in occupation was Henry Tash. Tash, who was a member of the City Council, died in 1821 at the age of 77. James Jackman was the innkeeper here from at least 1823 to 1832. “T. BISHOP / 3 GOATS / OXFORD”. 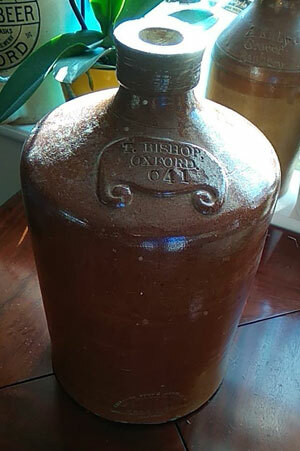 The second flagon shown is inscribed “T. BISHOP, / OXFORD / 041”. 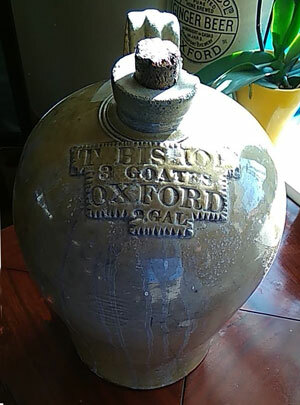 The number was to help the travelling pottery salesman remember the person who had ordered the flagon. Bishop died at The Three Goats on 20 January 1852, aged 58. In 1847 Alderman Sadler reported to the City Council, who owned the Three Goats, that he had spoken to Mr Morrell about widening the entrance to George Lane, which was much busier because of traffic caused by the railway. This would have necessitated Morrell pulling down and rebuilding the inn with a reduction in the renewal fine to represent the decrease un size of the building. This negotiation had been unsuccessful, but on 23 October 1852 it was reported that considerable alterations to the inn were in progress, and that James Morrell assented to the further alteration needed to make the entrance to George Street wider. The former pub was rebuilt on a grander scale in 1853 to designs by Homes & Lucas and renamed the George Hotel. George Drinkwater was granted a wine licence here at the newly built “George” in 1854/5, and he remained the landlord until 1881. The flagon on the right bears his name and that of the George Hotel. 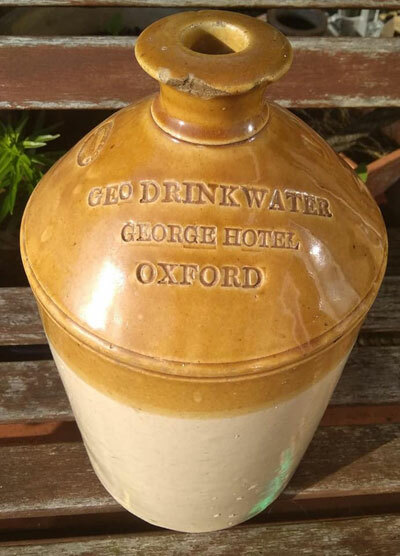 His son was the well-known Oxford architect Harry George Walter Drinkwater. Born in 1841, he spent his youth at the George, living here with his parents from 1854 to 1865. In the 1890s he was to design the new Elliston & Cavell shop that faced his father's old pub. There were then some short-term landlords: William Barrett in 1881; Andrew H. Milloy in 1885; A. B. B. Baker in 1887, and G. F. Snook (1890). Frank Gillard took over in 1901 and was the last landlord. The George Hotel was demolished in 1911. 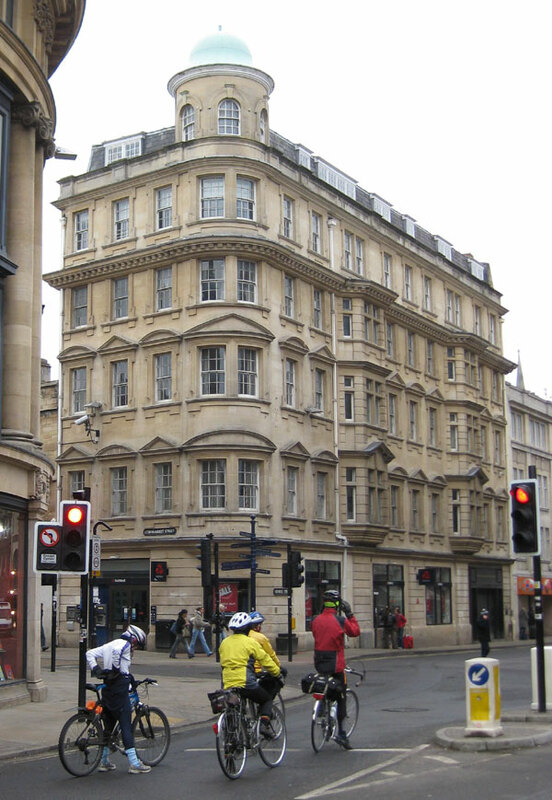 The present building by Homes & Lucas on the corner of George Street and Cornmarket was so much higher than other commercial buildings in Oxford at the time that when a photograph of the architect's drawing was published in the Oxford Journal Illustrated on 13 July 1910 it was described as “ the George Street sky-scraper”. On 7 October 1911 the National Provincial Bank of England, which had opened in 1909 in 14 Magdalen Street, moved into the ground floor of the new building. The George Café opened upstairs and on 19 February 1913 the Oxford Journal Illustrated published a photograph of its first-floor dining and tea room. In 1957 the National Provincial Bank took over the part of the premises occupied by the George Café. The bank was renamed the National Westminster after the merge of the National Provincial with the Westminster Bank in 1970. This branch of NatWest closed in November 2017 and reopened in smaller premises at 43 Cornmarket. (variously numbered 32/32A or 33 Cornmarket) listed in directories etc. The inn keeper at the “3 Goats’ Inn”was Thomas Bishop (50), who lived here with Ann Bishop (45) and Jane Alchin (15). They had five servants (four female and one male), and two commercial travellers were staying on census night. Thomas Bishop (54), now described as a wine merchant, was still at the “Goat’s Inn”, and was now a widower. Living with him was a temporary housekeeper and three female servants. Now renamed the “George Inn”. George Drinkwater (52), hotel keeper, lived here with his wife Eliza (46) and children Caroline (18), Harry George Walter (17), an architect’s articled clerk, Mary Ann (15), and Albert (9). The staff comprised a barmaid, cook, waitress, chambermaid, ostler, and boots. Three commercial travellers were staying at the inn on census night. George Drinkwater (62), licensed victualler, still lived here at the George Hotel with his wife Eliza (58) and their daughter Mary Ann (24). Also living with them was an assistant, a boots, and three servant. There was only one guest (a commercial traveller) staying at the hotel. George Hotel: William Barrett (49), hotel keeper, lived here with his wife Sarah and children Charlotte (1) and Samuel (14), both of whom were born in Torquay, and his Oxford-born niece Alice Summers (19). There were five live-in servants: an ostler, cook, chambermaid, waitress, and boots. Staying at the inn were two commercial travellers. George Hotel: Arthur Stedman (31), licensed victualler, lived here with his wife Emily (32) and their son Harold (1). Seven members of staff (described as servants) also lived on the premises: two barmaids, a cook, waitress, nurse, boots and billiard marker. The hotel had three guests on census night. George Hotel: Frank Gillard (62), hotel proprietor, lived here with his wife Annie (63) and their unmarried children Agnes (36), Robert (27), who was a veterinary surgeon, and Emily (22) and Florence (20), who were draper's assistants. Two barmaids and two domestic servants also lived on the premises. There were no guests on census night. No listing: building work not complete until October that year.